Spain’s far-right party Vox holds the key to the formation of a right-wing government in the southern region of Andalusia but is proving to be a tough partner for Spain’s mainstream right wing parties. Vox this week warned it wouldn’t back a coalition government in Andalusia made up of the People’s Party (PP) and Ciudadanos (Cs) unless the two parties agree to end funding for measures to fight domestic violence. 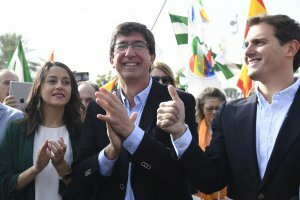 Formed in December 2013 by former PP members, Vox won a surprise 12 seats in Andalusia’s regional elections last month after campaigning on a nationalist, anti-feminist agenda and recent polls show it could play a crucial role in national politics. It was the first time that a far-right party has won representation in a Spanish regional parliament since the country returned to democracy following the death of longtime dictator Francisco Franco in 1975. The election outcome appeared to set up the end of 36 years of Socialist rule in Spain’s most populous region but the PP and Ciudadanos together only have 47 seats in Andalusia’s 109-seat regional parliament. Without the support of Vox they will not be able to form a government. The party’s demand for domestic violence legislation to be overturned sparked outrage in Spain where the fight against violence against women has been a national priority for years and where a resurgent feminist movement organised a massive strike in favour of gender equality last year. ‘This is not debatable, we will not retreat,’ Spain’s Socialist (PSOE) deputy prime minister Carmen Calvo tweeted. The national leader of the PP, Pablo Casado, said ‘one should not politicise domestic violence’. ‘On this issues we all have to row in the same direction,’ he added. But his party partially ceded to Vox’s demands on Friday by proposing that state aid to male victims of domestic violence be increased. ‘It seems to us to be a good start,’ said Abascal, who still wants the PP and Ciudadanos to sit at the negotiating table with Vox. The issue is especially tricky for Ciudadanos, which fears losing its more centrist credentials as well as its support in Europe by associating itself with a far-right party ahead of elections to the European Parliament in May. Spain has up until now been immune to populist, nationalist right-wing politics which have gained ground in Italy, France and other European countries. But Vox has surged in the polls over the past year, buoyed by its tough opposition to Catalonia’s independence push and rising migrant arrivals. The party defends bullfights, calls for pro-independence parties to be banned and wants an ‘impassable wall’ to be built around Ceuta and Melilla, two tiny Spanish territories in North Affrica which have the European Union’s only land borders with Africa. It also wants the national health service to cease paying for abortions and an end to ‘subsidized radical feminist associations’. Vox would capture 12.9% of the vote if a national election were held now, entering the national parliament with 43-45 seats, according to a poll published Wednesday in the daily El Mundo newspaper. If the PP, Ciudadanos and Vox joined forces they would have an absolute majority in the 350-seat parliament of as much as 189 seats, according to the poll. The survey comes amid rising speculation that Prime Minister Pedro Sánchez will call a snap general election this year. His Socialists have only 84 seats and are struggling to approve their draft 2019 budget.